This set of VLSI Assessment Questions and Answers focuses on “Device Modelling and Performance Estimation -2”. Explanation: Depletion mode MESFET operates as reverse baised (Vt is lesser than Vgs) and enhancement mode MESFET operates as forward baised. Explanation: Pinch-off voltage is the total voltage, both built-in potential and applied voltage necessary to completely deplete the channel of mobile charge carriers. Explanation: Pinch-off voltage is a function of both channel thickness ‘a’ and concentration density Nd and it is always positive. Explanation: The threshold voltage Vt is very sensitive to both the channel thickness ‘a’ and the doping of the channel layer. 5. The dynamic switching energy must exceed capacitive load. Explanation: In logic structure, the dynamic switching energy must exceed the energy stored in the capacitive load. Explanation: To keep dynamic switching energy small, the logic voltage swing must be kept small. This requires proper control over threshold voltages. Explanation: To achieve proper control over the threshold voltage, the standard deviation of threshold voltage should be maintained less than 5% of the logic voltage swing. 8. In D-MESFET, voltage swing is less than 1V. Explanation: In D-MESFET, the logic voltage swing can be larger than 1V which means tolerance to higher threshold voltage variation can be accommodated. Explanation: Threshold voltage is exponentially dependent on implant depth and there is the need for proper control of channel thickness. Explanation: The drain current saturates at the same drain to source voltage Vds and is independent of gate to source voltage Vgs. Explanation: The channel thickness should be controlled withint 20 armstrong and change is impurity concentration should be less than 20%. 12. Threshold voltage is independent of pinch-off voltage. Explanation: Threshold voltage is dependent upon pinch-off voltage Vpo and barrier potential and this is given as the difference between the two. Explanation: Pinch-off voltage is directly related to the effective channel concentration density Nd. 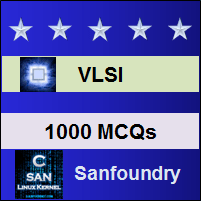 To practice all areas of VLSI Assessment Questions, here is complete set of 1000+ Multiple Choice Questions and Answers.